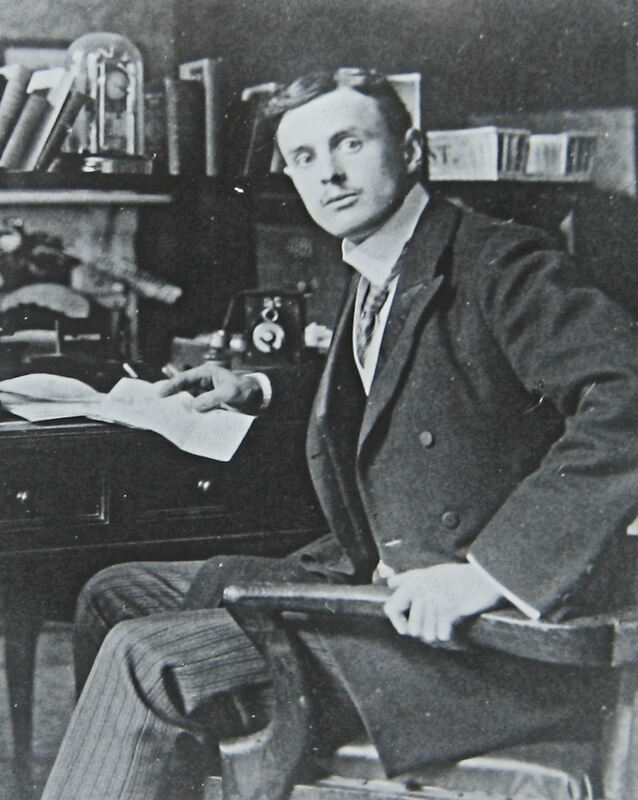 Charles Stewart Rolls was born in London on 27 August 1877 into an wealthy family. His father, John Allan Rolls – 1st Baron Llangattock, made his fortune through agriculture in Monmouth, Wales. Shortly after the birth of Charles, he bought a villa in Knightsbridge and ensured that his son received an upper-class eductaion. It was while at Eton that Charles developed an interest in engines and on graduating with a degree in Mechanism and Applied Science from Trinity College, Cambridge, he bought his first car, a Peugeot Phaeton. A founder member of the Automobile Club of Great Britain, in 1903, with the help of a £6,600 loan from his father, Charles started one of Britain’s first car dealerships. C.S.Rolls & Co was based in Fulham and specialised in importing Peugeot and the Belgium Minerva cars. Although Charles had a business head with an eye for an opportunity, both his family and contemporaries saw him as an odd sort of chap. Very tall, (1.95m – 6’5″), aristocratic and eloquent, Charles disliked mixing with his own class. Reading about him, I am reminded of Henry Higgins in ‘My Fair Lady’, especially in the way he treated his mother’s friends. Charles was also a vegetarian, unusual in those days, but smoked very heavily. He would frequent the music halls and afterwards could give a full account, accurately mimicking the various acts. Charles was also very restless but once he set his mind on something, he would make it his own. It is therefore not surprising to read that he took up ballooning and was a founding member of the Royal Aero Club. In 1903, he won the Gordon Bennett Gold Medal for the longest single flight time. The 4 May 1904 saw the historic meeting between Charles and Henry Royce, car dealer, took place at the Midland Hotel, Manchester and on 23 December they signed a deal. Charles would take all the cars that Henry could make. Two years later the partnership was formalised as Rolls Royce Ltd.
On 19 September 1899, Charles was in Dover to attend the town’s first motorcar exhibition at Crabble Athletic Ground. Organised by the Mayor, Sir William Crundall (1847-1934) members of the Automobile Association drove down from London for the event and 25 or 26 vehicles of various types took part in a grand parade round the cycle track, including Charles, who drove a Panhard. The Mayor was driving an electric phaeton belonging to Alfred Harmsworth (1865-1922), later 1st Viscount Northcliffe, the owner of the Daily Mail newspaper. Harmsworth was also a close friend of Claude Johnson (1864-1926), who later was to play a key roll in the Rolls-Royce company. 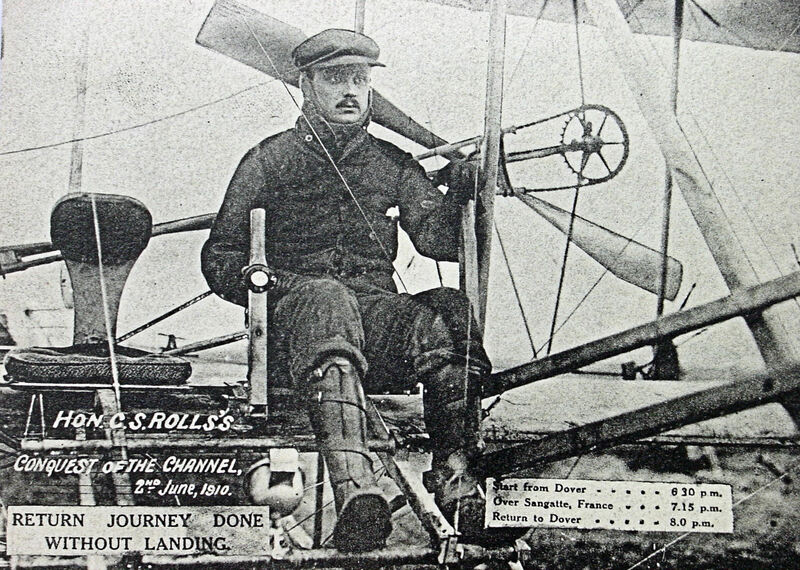 Charles Rolls awaiting to take off for his memorable flight 2 June 1910. Dover Library. However, Charles’s fascination for flying continued to grow and having first met Orville and Wilbur Wright, who had made the world’s first powered controlled sustained flight, in New York, he tried to persuade Henry Royce to build a machine. Henry was not interested but undaunted, Charles bought a Wright Flyer aircraft, built under licence by Short Brothers, in which he made more than 200 flights. In the spring of 1909 the Wright brothers came to England and Charles was their official host on behalf of the Aero Club. On 25 July that year Louis Blériot make the first heavier than air crossing of the English Channel and this put France in the lead in European aviation. Charles won the imagination and hearts of his English compatriots when he announced that he was going to do the double crossing of the Channel! On his first visit to Dover, with this in mind, Charles decided to open an ‘aeroplane garage’ at Swingate, to the east of the Castle and the aerodrome he was to use. 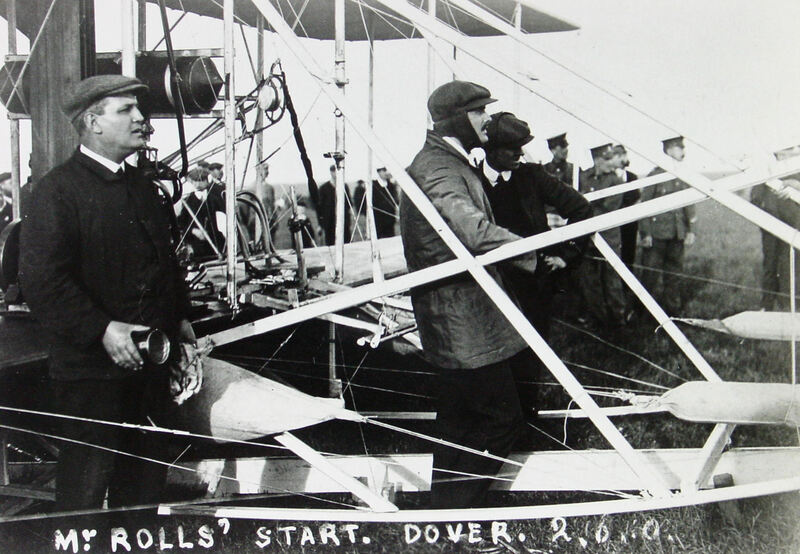 On 20 May 1910, a Charles Wright flying machine arrived at Dover and the word was out that Charles was to make the double crossing of the Channel! Trials subsequently took place, and on 2 June, crowds made their way up to Swingate aerodrome to watch. With everything to his satisfaction and ideal weather conditions Charles left Swingate at 18.30. He was over Sangatte, France, at 19.15 and back in Dover at 20.00. The journey had taken 95 minutes and he circled the Castle in triumph! Over 3,000 people witnessed the event, after which Charles was carried through the town shoulder high. A month later, on 12 July 1910, Charles Rolls lost his life due to a controlling wire breaking that had been added to his original Wright Flyer. The accident happened during a flying display at Bournemouth. Charles was 32 and the first Briton to be killed in an aeronautical accident. On 27 April 1912, a statue to Charles Rolls was erected in the Guilford Gardens on the Seafront and unveiled by John Campbell 9th Duke of Argyll (1845-1915). His ancestor, John Campbell 5th Duke of Argyll had been Dover’s Member of Parliament for four years from1762. 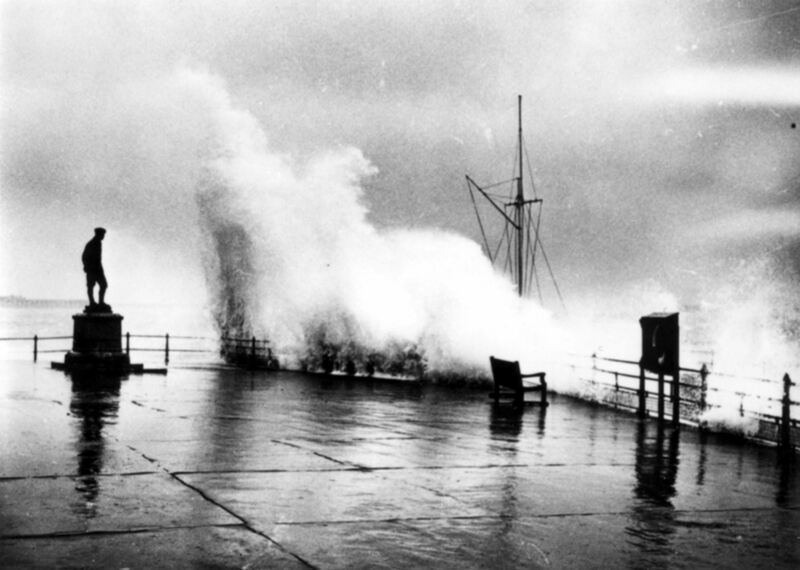 During World War II (1939-1945), the base of the statue was damaged and along with the statue of Captain Matthew Webb (1848-1883) – the first person to swim the English Channel without artificial aids – they were removed to safety. 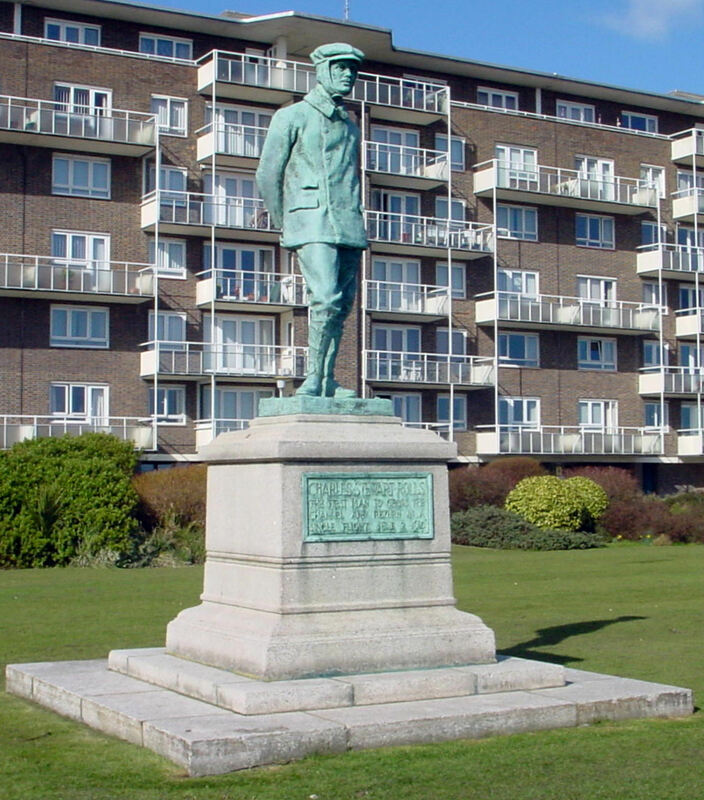 Following the war, both statues were returned to the Seafront but the whole area had been devastated and there were no gardens left. In March 1951, the Charles Rolls statue, with pomp, was placed as near as possible in its original position. Two years later, in 1953, following a major change in Dover Harbour Board policy, the Eastern Docks became the main cross-Channel terminal. Coincidental to this was the rise in the use of the motor car and to cope with the influx of traffic to the Docks the access roads were widened at the expense of the Seafront. Both the Webb and the Rolls memorials were in the way of the new road configuration and in September 1991, the Webb memorial was removed to the Gateway Gardens on Marine Parade – very close to its pre-war site. The Rolls statue was relocated in front of a public lavatory! This led to a public outcry and locals Budge Adams and David Atwood, campaigned to have the statue moved. Eventually it was moved to its present position in Marine Parade gardens in front of the Gateway flats. 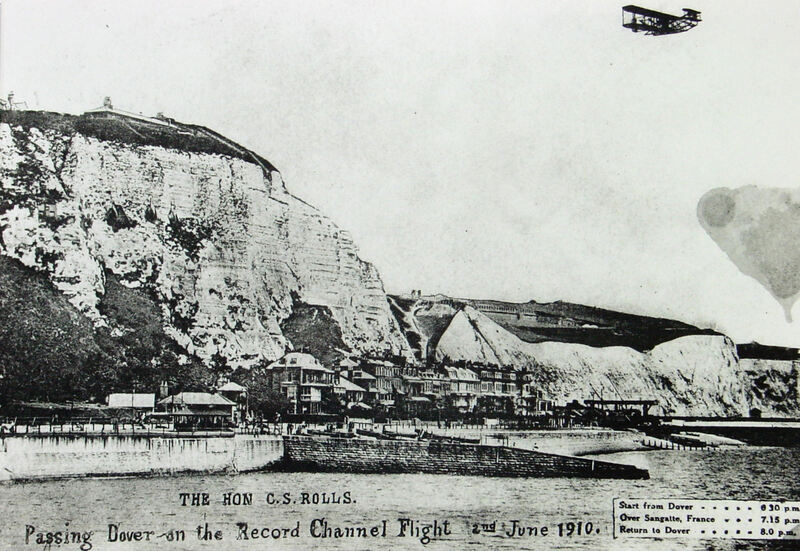 This entry was posted in Aviation, People, Rolls Charles - the first two-way non-stop English Channel flight, Rolls Charles - the first two-way non-stop English Channel flight, Rolls Charles - the first two-way non-stop English Channel flight, Sea Front. Bookmark the permalink.